I few weeks ago I shared how to make juice without a juicer. Now I’m going to share how to use that juice in the coveted GAPS Milkshake Recipe. The idea behind the GAPS Milkshake recipe is simple: even vegetable juice can spike blood sugar, and some do not tolerate it well. This “milkshake” adds healthy fats to slow the absorption of the sugars and provide a very nourishing drink. In Gut and Psychology Syndrome, Dr. Natasha proclaims the wonderful benefits of juicing to aid in detoxification and constipation. I never thought I would get into it, but I grew to really enjoy and benefit from a morning carrot juice! As increasing fats can help with constipation, the GAPS Milkshake has double the constipation-fighting power. A welcome option for many people! The components of the GAPS Milkshake recipe are freshly pressed juice, raw eggs, and a healthy fat. Using whole eggs is recommended, but you can also use just the yolks depending on your tolerance and preference. Cultured cream is the preferred fat source, as it is full of probiotics that further help healing. Coconut oil is what is recommended next. However, if you do not tolerate dairy and haven’t introduced coconut oil, you may still find yourself needing a GAPS Milkshake during Intro. Feel free to use ghee or butter (if tolerated). It tastes amazing! When using ghee or cultured cream, this shake is Stage 4 legal. 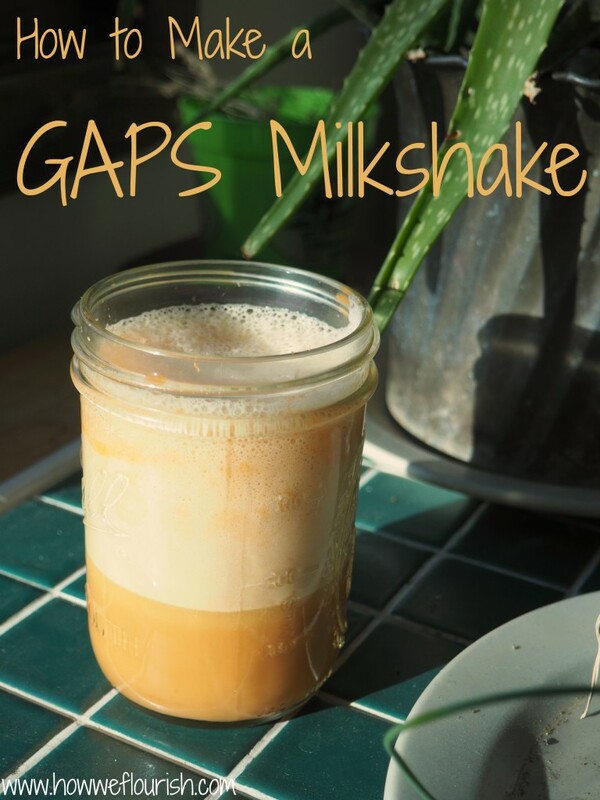 The GAPS Milkshake is incredibly easy to make. First, start with a cup of freshly pressed juice. I just use plain carrot juice. 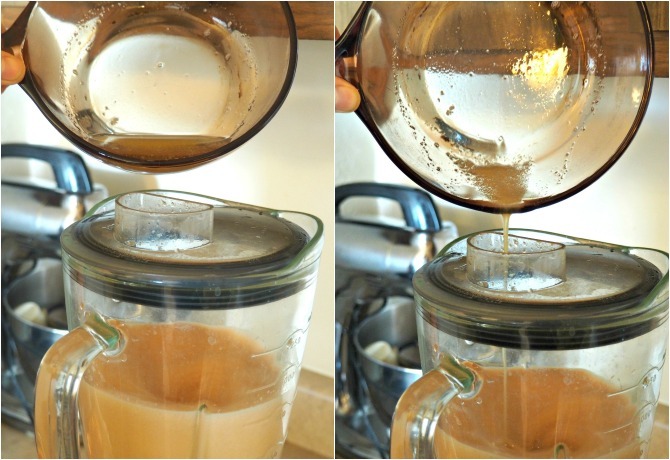 If you used your blender to make the juice, be sure to rinse the pulp out, as the juice needs to go right back in. If using coconut oil, ghee, or butter for your fat source, the mixture must be emulsified. Melt the fat until it is just liquid (you don’t want it too hot or it will cook the egg). Turn the blender on low and slowly pour the fat in until everything is well combined. It might be a little foamy, but the fat should not separate out. Pour yourself a glass and enjoy! As always with GAPS foods, introduce the milkshake slowly, starting with just a couple tablespoons. You can increase this up to two glasses at day – one in the morning and one in the afternoon – if needed. Take on an empty stomach for the best therapeutic benefits. Before I get to the formal recipe card, know that I am posting this because there is not an official GAPS Milkshake recipe, and many have requested one. The amounts I give are based off of the guidelines I have found for creating a GAPS Milkshake, and will vary based on your personal needs. For example, I can add two eggs and two tablespoons of fat to my shake, and it is a meal replacement. And we don’t like meal replacements on GAPS! For someone else, the same amount might just be a snack. So listen to what your body needs regarding both ratios and amounts. Fresh pressed juice should be consumed as soon as possible for maximum therapeutic benefit. However, if you have some leftover, it can frozen for a creamy treat. A delicious, creamy drink for constipation, detoxification, fat malabsorption, blood sugar control, and enjoyment! Blend the juice and eggs on low until well combined. If using, blend the cultured cream and enjoy. If using coconut oil, ghee, or butter, melt until just melted. Turn the blender on low. Slowly pour the fat into the blender so that the ingredients emulsify. Shared on Allergy Free Wednesday. I would love to try this! Thanks for sharing it this week on AFW! How many carrots would it take to make that? I haven’t juiced before, but would think it would take a lot! Wouldn’t that also be really high in carbs? 1. It really depends on the size of your carrots and the efficiency of your juicer. I needed a different number of carrots every time I made it! But yes, it is a decent number. 2. The fat added helps slow the absorption of the carbohydrates. When I drink a GAPS milkshake, my energy is stable and I am not very hungry at all for several hours. This recipe is what is recommended for people who are not able to juice because of the carbs. I juice 1 small apple, 2 carrots, add 4T coconut oil and 2 eggs, but I add a full T of cinnamon to balance blood sugar. It’s wonderful and I tolerate it very well!